Choosing Running Shoes: How Do I Pick the Right Running Shoes for My Feet? What Does Science Say About Running Shoes? The review, published in The British Journal of Sports Medicine, looked at decades’ worth of studies about the relationship between running injuries and shoes. Dr. Nigg and colleagues found that there are many popular misconceptions about running shoes. For instance, one study of 1,000 runners–some pronators, some not–gave everyone the same pair of running shoes and followed them for a year. It turns out that many of the runners with “normal” feet and form were injured compared to those who overpronated.2http://bjsm.bmj.com/content/early/2013/06/12/bjsports-2013-092202.abstract “A pronated foot position is, if anything, an advantage with respect to running injuries,” Dr. Nigg concluded. He also found little evidence that a forceful heel strike causes injury or that changing shoe type impacts the type of injuries sustained in any meaningful way. In a series of studies of military recruits assigned special shoes tailored to their level of pronation, it was found that soldiers were as likely or more likely to develop running injuries with the special shoes than soldiers given shoes at random. In a 2001 study overseen by Dr. Nigg, 206 military recruits were given a choice between six different shoe inserts that varied by cushioning, arch height, heel shape, and thickness.3http://www.researchgate.net/publication/10658602_Relationship_between_footwear_comfort_of_shoe_inserts_and_anthropometric_and_sensory_factors They were instructed to choose the insert that “felt the most comfortable,” without being given any other details. The control group received a standard pair of running shoes without inserts. After four months, the soldiers who chose the inserts most comfortable to them had 1.5 to 13.4% lower rates of stress fracture and pain than those wearing standard shoes. One may conclude, based on the existing body of research, that the body is the best judge of how we should move and run. Inserts can work to reduce pain and injury, but different types of inserts appeal to different patients and must be customized to suit individual comfort preferences. Trying to “fight the body” and “control pronation” actually leads to more injuries. Truly, the best way to choose is to try on four or five pairs of running shoes, says Dr. Nigg, and jog around the store or the block in each. Choose whichever shoe feels most comfortable; it’s that simple! Still Need Help Choosing the Best Running Shoes? Did you ever think a pair of shoes was “super comfortable” in the store only to find out that it was rubbing against your heels, squishing your toes, or causing untold agony a month or two later? Our NYC Podiatrists can help! 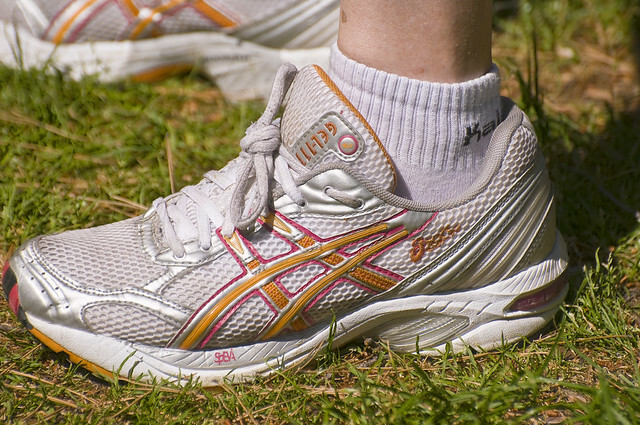 Chances are, you are merely choosing the wrong size running shoe. Consumer Reports once found that 12% of Americans were wearing the wrong shoe size–off by 1.5 sizes or more. Studies link poorly-fitting shoes with hammer toes, bunions, nerve damage, plantar fasciitis, blisters, corns, calluses, ulcers, and Achilles tendon pain. Here at The Center for Podiatric Care and Sports Medicine, we share our expertise with shoppers who are tired of being slowed down by foot pain or injury. We can help you determine the correct shoe sizes, styles, and brands that meet your needs. Contact us for an appointment in Westchester or Manhattan (near Central Park). » What Is Proprioception and Why Do Sports Medicine Doctors Recommend It?